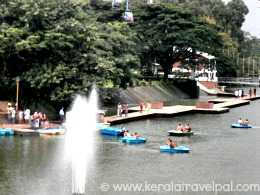 Malampuzha gardens, located about 5 kms from Palakkad town, is a dam garden destination. 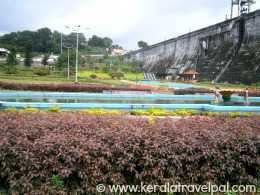 It is one of the pioneering hydel tourism locations in Kerala. My first visit to there was in the late seventies as a small kid. 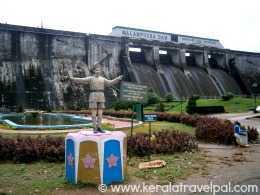 At that time, it was the prime tourist spot in mid Kerala. Today, even after the advent of a host of family friendly tourist spots all around, Malampuzha still is an important tourist place. The main attraction is the dam itself. 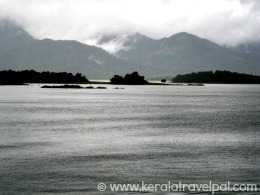 It is built over a tributary of Bharatapuzha, one of largest rivers of Kerala. The reservoir encompassing a catchment area of 145 sq kms, is one of the largest in Kerala. Palakkad, otherwise an arid district, became highly productive to be named as ‘the rice bowl of Kerala’. It happened so only because of the water supply from Malampuzha dam. Designed as a mini hydro electric project, the dam also provides drinking water to Palakkad town and villages around. 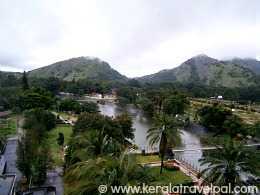 Malampuzha also has a garden, boating facilities, fish-shaped aquarium, snake park, rock garden and ropeway. Fantasy world, an amusement park is just in the vicinity. Sightseeing spots in the wider area are Kava, Tippu’s fort and Dhoni waterfalls. 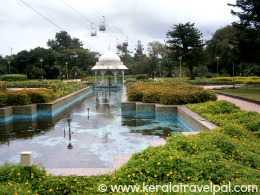 Malampuzha gardens are well landscaped and decorated by fountains and sculptures. The statue of Yakshi (enchantress) at Malampuzha is colossal, unconventional and quite famous. It is created by Kanai Kunhiraman, the renowned sculptor of Kerala. Malampuzha gardens are set towards the front side of the dam, on either side of a canal. A couple of hanging bridges facilitate passage in between. Malampuzha rock garden is created out of unwanted junk such as broken bangles, empty plastic cans and so forth. Its creator, Neck Chand Saini, is also well admired as the talent behind Chandigarh Rock Garden. A 20 minute rope way ride atop the garden comes with uninterrupted view of the surroundings. While entering into the Gardens from the Ticket counter, find out where rope way starts. Otherwise you may have to walk the whole way back, to reach the rope way station. There is also a small Japanese garden and a children’s park. The fish shaped aquarium, while not big, is an interesting structure that keeps some displays of fish. An exciting part of Malampuzha visit is the boat rides. View from the top of the dam is quite extra ordinary. With a vast reservoir on one side and a well designed garden on the other, the dam top is the avenue for the best sightseeing experience in Malampuzha. A mountain chain encircles it all, pretty much as a calming influence. There can be some confusion about reaching the top of the dam, especially so, if you are not finding any pointers or displays. There are steps located at intervals that take you to the top of the dam. In my last visit, we took the steps near the end of the second garden. Located near the main entrance of Malampuzha Gardens is the snake rescue and rehab centre run by the Kerala Forest Department. The crowd puller here is a couple of King cobras. Besides, they have several cobras, vipers, kraits and many more species of snakes. An amusement park close to Malapmuzha, Fantasy Park has a range of rides, both wet and dry. To stay on as family fun place, they have included appropriate rides for kids and adults. Dhoni waterfall is only 3 kms away from the dam however the driving distance is 12 kms. Taking on the trekking path from Dhoni to Malampuzha is good fun, if time and other factors permit. You may need some local guide, in case decide to venture. Kava is a remarkably peaceful and incredibly beautiful place near Malampuzha reservoir. Only 6 kms away from the dam, Kava fortunately is not a part of mainstream tourism. If you have plans to be there, better to organise own transport since only limited bus services touch Kava. 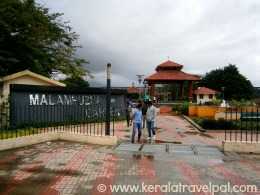 Tippu’s Fort is in the middle of Palakkad town itself. Built by the Mysore ruler Hyder Ali around 1776, it is known today by his son Tippu Sulthan’s name. It is simply a defence bastion only worth visiting if you are in town. Food Options : Only ice cream shops and small kiosks at Malampuzha. Several restaurants are there in Palakkad town. Accommodation Options : Lodges and hotels at Palakkad town. Best time to visit : Can be visited throughout the year. 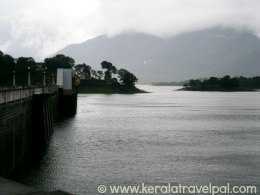 Nearby Attractions : Dhoni waterfall, Kava, Palakkad City (shopping & food), Palakkad Fort, Silent Valley National Park, Thiruvalathoor Bhagavathy Temple, Walayar Dam, Chulannur Peacock Protection Centre, Kalpathi, Mangalam Dam, Parambikulam Sanctuary, Nelliyampathy hill station, Pothundi Dam, Meenvallam waterfall and Attappadi.